I love this year’s trend of mixing leather and fabric on a garment. 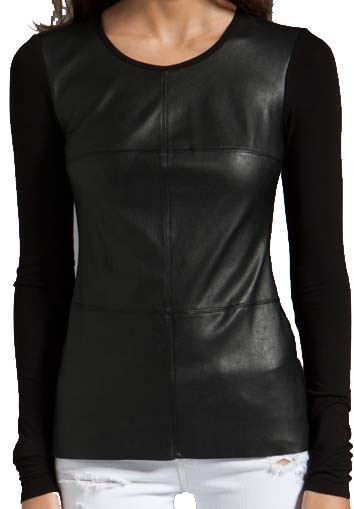 The look is sharp and edgy and yet more restrained than an all leather outfit. Yesterday I wore a sleeveless top with a leather front and a cotton knit back. The day was hot, but I was cool in my top and yet looked, if I may say so, rather sharp. As I often do, I spilled food, in this case a decadent concoction of ice cream and espresso, on my top. No problem. Wiped it right off.